Thelidium lichens, together with those that lie in tiny pits in calcareous rock — like a scatter of dots — can often draw a groan from the lichen beginner as though they, more than any other, are well beyond the scope of the novice. But not so. Simply dig out the disc with the edge of a razor blade, leave to soak in a droplet of water for a few minutes, and then squash it under a microscope slide in a weak solution (for example, 10 per cent) of water and KOH. T. decipiens has its well-spaced, spherical discs (perithecia) always sunken into pits with their tops barely showing. 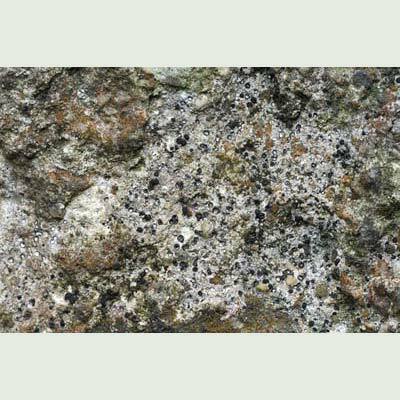 The thallus is mostly below the rock surface but may show a white, cream or brown colouration. Its spores are narrowly egg-shaped and one-septate (length/width ratio: approx. 30 x 12ųm). It grows on limestone and mortar mainly. West and north-west Ireland. Spores one-septate, narrowly egg-shaped; on limestone, mortar and calcareous sandstones. Simms, M. J., (2016). Thelidium decipiens (Nyl.) Kremp.. [In] LichenIreland.